A few months ago I had lunch with a friend of mine and we enjoyed this wonderful bottle of chardonnay. I took tasting notes and of course meant to write a blog on it, which didn’t happen. The next morning I couldn’t find the paper and thought I had lost it. Thankfully earlier today while I was doing a little spring cleaning I found it, tucked between my dresser and or course the wall. Better late than never I suppose. Just west of Chassagne-Montrachet lies the small village of St-Aubin. So small in fact it only has about 270 residents. Unlike the rest of the Cote d’Or St-Aubin lies off of the main village escarpment and is nestled in a small valley. Wineries may produce both red and white wines though white is the main focus. There are no Grand Crus designated in the Village of St-Aubin. Originally founded by Jean-Claude Bachelet the vineyard is now run by his two younger sons Jean-Baptiste and Benoit Bachelet. The family owns land in Chassagne-Motrachet, Puligny Montrachet, and of course St-Aubin. 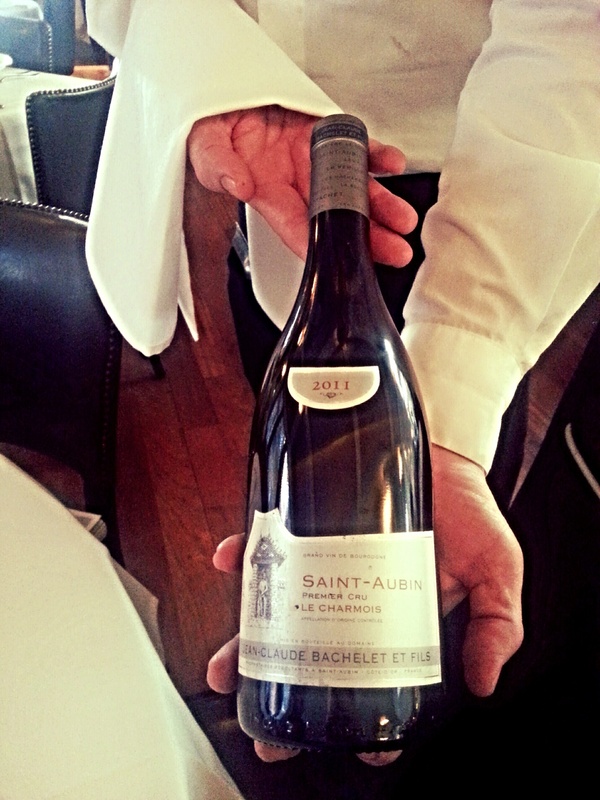 Their Premier Cru wines are aged anywhere from 16-18 months on approximately 40% new French oak barrels. Medium Bodied 13.5% Alc. By Vol. This refreshingly crisp white Burgundy opens with scents of lime zest, crushed rocks, vanilla, and even has slightly sweet scents of green apple and green jolly ranchers. The acidity on the palate is exceedingly sharp, with very lite glimpses of its oak. Flavors of lemon, green apple, and lite vanilla make this a wonderful choice for warmer weather or pairing with salads, fish, and shellfish dishes.